This Prospector didn’t strike it rich… | Shortfinals - aviation and more! SR.53 – the great rocket-powered hope! Nearly a Meteor, almost a Thunderbolt, this is a jet on the Rampage! 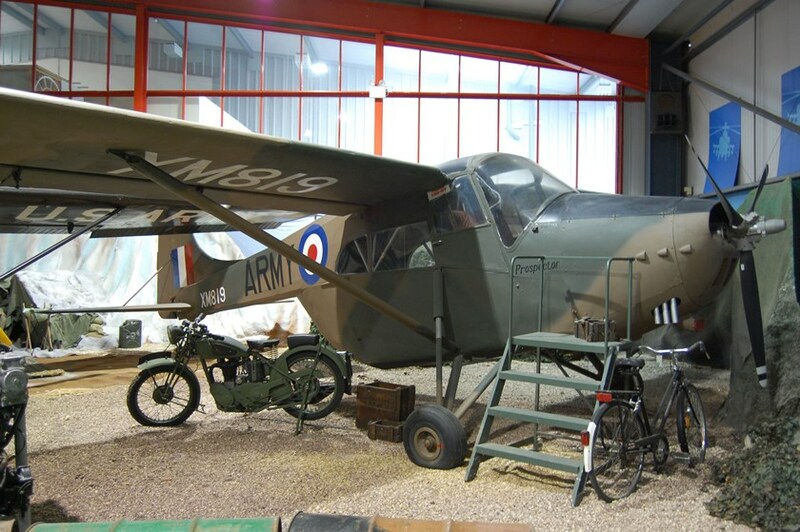 The Museum of Army Flying at Middle Wallop, Hampshire, is a truly wonderful place. It might be small, but it makes use of every available cubic inch to entertain and delight both the general public and the specialist visitor. The British Army can truthfully be said to have started military aviation in Great Britain, with the balloon/airship and man-lifting kite experiments in the 19th and early 20th century. The Royal Air Force took over the ‘aviation business’ from the Army and the Royal Navy in 1918, but the Glider Pilot Regiment and Air Observation Post Squadrons got them back into the field during WW2. In 1957, the Army Air Corps was formed, and began to develop its own ‘battlefield role’ in support of other British Army units. Obviously, a great deal of experimentation took place, and some aircraft types were ordered in small quantities so that their use could be explored – the Edgar Percival EP.9 Prospector fell into this category. Edgar Wickner Percival was an Australian fighter ace of the First World War, who became a noted test pilot and aircraft designer post-war. He founded an English-based aviation concern, Percival Aircraft Company Ltd, and began producing racing and long distance, including the famous Vega Gull and Mew Gull. During WW2 the company produced Percival Proctor radio trainers and liaison aircraft, but also the de Havilland Mosquito under licence. Edgar Percival sold his interest in his company when it became part of the Hunting Group in 1944, and moved to the U.S.A, where he continued designing. In 1954, he felt the urge to build aircraft again, and formed a new company in England called Edgar Percival Aircraft Limited. He designed a utility aircraft, which could also be used for spraying crops and as a light transport, called the E.P.9 Prospector. The prototype, G-AOFU, first flew on 21st December, 1955 in the capable hands of Edgar Percival, himself. It was powered by a Lycoming GO-480-B of 270 hp, giving a maximum speed of 137 mph, and was very versatile, being able to spray one ton of fertilizer or other chemicals from a hopper which was removable through its rear clamshell doors, or carry three stretcher cases (plus attendant), four parachutists, four passengers in the rear plus one beside the pilot, and ‘rural’ loads such as oil drums or even livestock! The aircraft was capable, but it looked a little like someone had mated the rear half of an Auster with the front half of a Cessna 337 ! A short production run of 20 was initiated, and sales were made in France, New Zealand, Australia and Canada. The Army Air Corps became interested in the E.P.9 as a utility type, and Edgar Percival demonstrated it at the Royal Military College, Sandhurst and the AAC HQ at Middle Wallop. Following this, a pair of E.P.9 were purchased by the Army and delivered in military camouflage (Dark Green and Dark Earth, all surfaces); the serials were XM819 and XM797. These aircraft were flown extensively, but the reason that more were not purchased may be due to the fact that the import of American-built engines was severely restricted at this point in time, due to heavy import duties. In 1958, Edgar Percival sold his new company to Salmesbury Engineering Ltd, including the rights to the design, and uncompleted airframes, who then moved everything to Squires Gate Airport, Blackpool on the Irish Sea coast. The aircraft was renamed Lancashire Prospector E.P.9 and five more machines were completed, four with 295 hp Lycoming GO-480-G1 engines driving three-bladed propellers and one as the only new-built Series 2, with an Armstrong Siddeley Cheetah 10 radial of 375 hp (another was converted in Australia). Production ceased in 1960, despite the Series 2 being exhibited at that year’s SBAC Farnborough Air Show. The AAC aircraft were declared surplus and were de-militarized by Steels (Aviation) Ltd. at Staverton Airport. A number of E.P.9s were sold second-hand in the U.S.A including one of the Army aircraft G-ARTV (former XM819) where it was registered as N747JC to Jan Christie of Wisconsin; it appeared for several years at Oshkosh (I have seen a photograph of it on display there in 2001). Unfortunately, it is now no longer active, according to the FAA. I suppose that it had a very full career, as part of its ‘work’ – when it was on the Belgian register, from 1970 to 1973 – was done by a group of smugglers, carrying furs and counterfeit currency between the U.K. and Belgium! The former XM797 was owned by the Old Warden Flying and Parachute Group and met a most unfortunate end, crashing on take off at Old Warden, the home of the Shuttleworth Trust, when carrying parachutists. The aircraft you can see here is a composite of G-APXW, a freighter and the tail section of XM797. Since G-APXW was powered by a GO-480-G1, it has the incorrect three-bladed propeller and downward ejector exhausts. There is another E.P.9, in airworthy condition, painted as “XM797”, with the South African Air Force Historic Flight at Swartkop, South Africa, and a very fine example active in New Zealand, ZK-PWZ, based with Kairanga Aviation Ltd. The E.P.9 could have proved to be a worthy ‘bush aircraft’, even today, and I am sorry that so few were sold. Still, it represents a very rare military type, and one that not too many would have heard of. Great story – thanks for sharing. I agree with travelforaircraft, the diorama makes all the difference in bringing the aircraft to life.